In the bowl of a stand mixer, combine 2 cups flour, sugar, yeast and salt. Set aside. In a small saucepan, melt butter and milk over medium-low heat until butter is just melted. Remove from heat and add water and vanilla extract. Cool to 115°F. Pour the milk mixture into the flour mixture and stir on low speed. Add eggs and stir until everything is just mixed, about 2 minutes. Add the remaining 3/4 cup of flour and stir on low-medium speed (about #2 or #4 on your stand mixer) for about 2 minutes. The dough will be quite sticky, but that’s OK.
Pour the dough into a lightly greased bowl, cover and let rise until doubled, about 1 hour. In the meantime, whisk together sugar, cinnamon and nutmeg in a small bowl and set aside. Melt butter in a small sauce pan until just browned and set aside. Grease a 9 x 5-inch loaf pan and set aside. Remove risen dough from bowl, punch down and knead in 2 tbsp of flour. Let rest for five minutes, covered with a kitchen towel. On a lightly floured surface, roll out the dough using a rolling pin into a 20 x 12-inch rectangle. Brush on the butter, then sprinkle evenly the cinnamon-sugar mixture. Slice the dough north to south into six even strips. Stack the strips and slice that stack into six equal squares (you’ll have six stacks of six squares). Prop up the loaf pan on the rolling pin and stack the squares cut-side down into the pan so it looks like a stack of papers. Sprinkle some of the extra cinnamon-sugar mixture that spilled on the countertop on the top of the loaf. Cover the pan and let rise until doubled, about 30 minutes. When dough is doubled, uncover and bake about 35 minutes, or until the top of the dough is a deep, dark brown. Remove from oven and allow to cool in pan for about 20 minutes. Then, run a butter knife along the edges of the pan to loosen the loaf, invert onto a plate and then invert again, ride side up, onto a pretty plate to serve. Serve warm. This is the kind of bread that you just know will be good. The list of ingredients alone screams, “Hello! I’m amazing!” It’s a confident bread, that’s for sure. 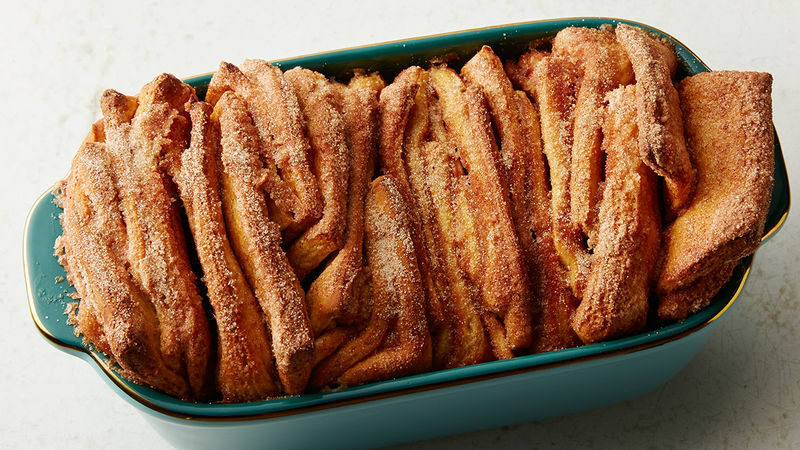 But with a name like Cinnamon Browned Butter Pull-Apart Loaf, can you blame it? I didn’t think so. My instincts, thankfully, were right about this bread. This is the kind you make when you’re having a bad day, or when your house is a wreck and you’d rather bake something yummy instead of clean up the pen and paint marks adorning the walls or the pile of dirty socks sitting in the living room. It’s the kind of bread you make when you really want dessert, but you want to be healthy, so you figure if you work real hard (or not really that hard) you’ll deserve dessert. Though you and I both know you shouldn’t have to deserve dessert – if you want dessert, have it! This is also the kind of bread you bake when you have a taste for cinnamon. Or browned butter. Or nutmeg. Or butter. Or all of the above. This bread can be easily adapted to your own tastes, however, like with lemons instead of cinnamon and nutmeg, or with apples worked into the dough, or perhaps tinged with orange zest. But this way, too, is perfect – the kind of thing you make when you just need a guaranteed delicious recipe. This bread won’t let you down!